Season the chicken with garlic, onion and salt. Let marinate approximately 4 hours in plastic bag, refrigerated. Flip the bag so all the pieces become seasoned or you can leave them all night. To prepare the sauce mix the rice vinegar, honey, ketchup, cornstarch, chili pepper and water in a pot. Cook over low heat over 15 minutes and stir constantly. Remove the fire and let cool. Mix the flour, cornstarch with the salt and pepper in a large bowl. Pass all the pieces of chicken through the flour mixture and dust them off a bit to remove excess flour. Once the chicken is marinated and floured heat the oil in a saucepan over medium heat, fry the chicken in batches, set a side and keep warm. 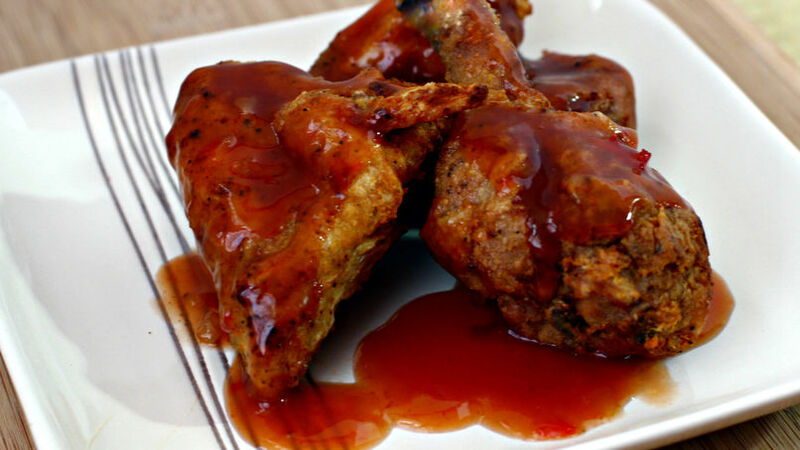 When the chicken is fried, pour the sweet and sour sauce on top of the pieces of chicken. Make sure all the pieces are covered in the sauce and serve immediately. You shouldn't cook the chicken at high heat because you'll end up with and uncooked meat inside. If you have a deep fryer you can use that. If you like your chicken nice and crunchy you can mix the flour, cornstarch, salt and pepper with one cup of water and cover the pieces of chicken in the mixture. You can also add a bit of ground chili pepper if you like your fried chicken spicy. I don't usually fry my food, but sometimes I have to make exceptions and this fried chicken recipe is one of them. Some time ago I went to eat at a Korean restaurant with the idea of ordering some mandu, very similar to dumplings. However, it was someone else's food that caught my attention and my appetite. I couldn't resist the temptation of ordering the same for myself so that I too could enjoy the delicious pieces of chicken. What I liked the most is that it wasn't greasy. This is why I decided to prepare them at home. If you're looking for a way to surprise your kids or guests with a simple dish filled with flavor, I'm sure they'll love this recipe. You can also serve it when you have your husband's friends over. Enjoy!